The Great American Read is back on PBS this fall. Visit the Library to see the episodes before they are on national TV. Discussions will take place after the screenings. 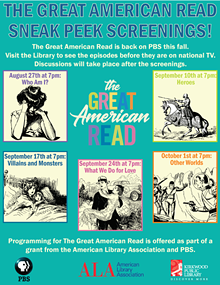 Programming for The Great American Read is offered as part of a grant from the American Library Association and PBS.